After many weeks with cafés receiving scores in the sub-twenties, we are delighted to present to you… Café Ella. It’s a weekday staple for students walking to Sydney Uni from Redfern station and on the weekends the locals are lucky enough to have it to themselves. We’ve eaten there for lunch a few times and it was recommended by a reader in our request for recommendations post. Ordering and payment is done first at the cash register, then you’re free to select a table upstairs, downstairs, in the courtyard out the back or on the sidewalk. 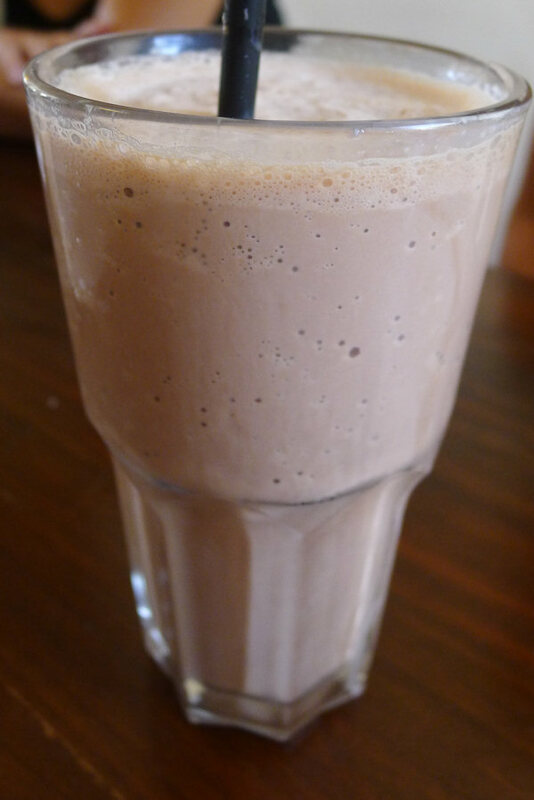 Our guest tried the chocolate milkshake ($4.50) and was very happy with the chocolaty goodness. She slurped it all up and barely had enough room in her stomach for her meal. Another fantastic drink was the berry smoothie ($5.50). The menu doesn’t specify what flavours are available so you’ll need to rely on experience or ask the staff. We were given the option of yoghurt or ice cream. 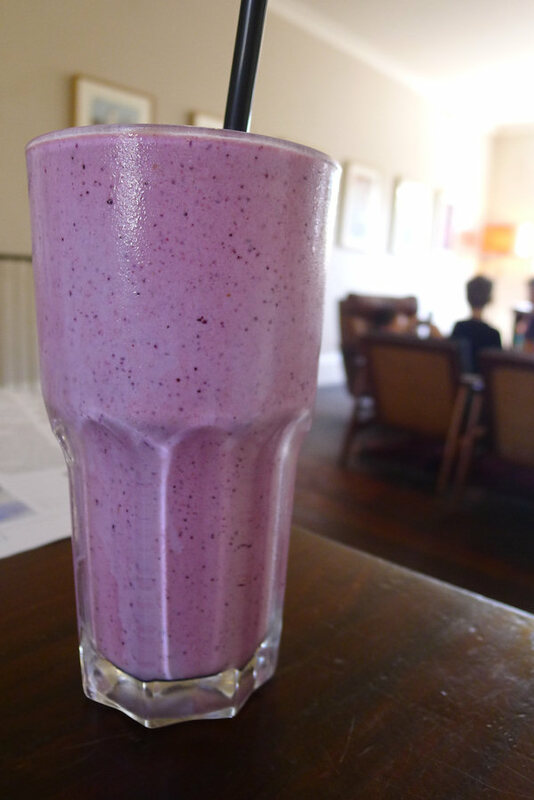 We chose yoghurt for our drink and it was definitely one of the best smoothies we’ve tasted for a while – thick and full of fresh and different berries. 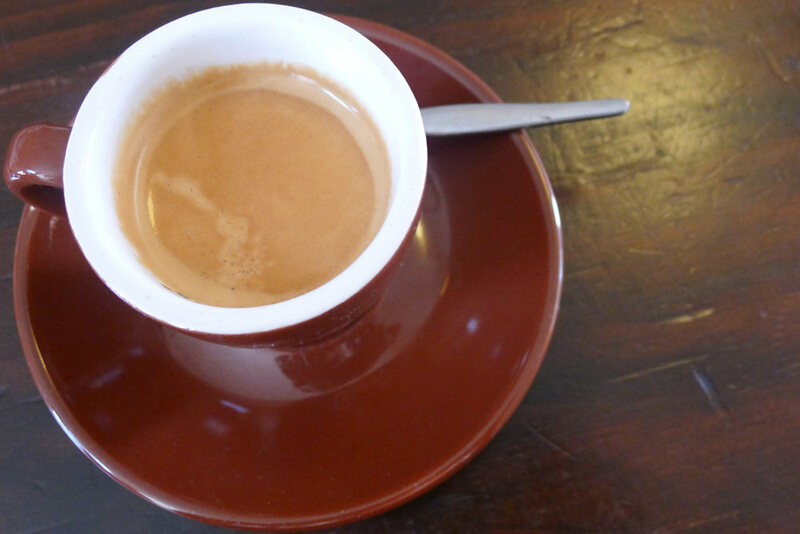 The short black ($2.80) was a bargain and hit the spot. 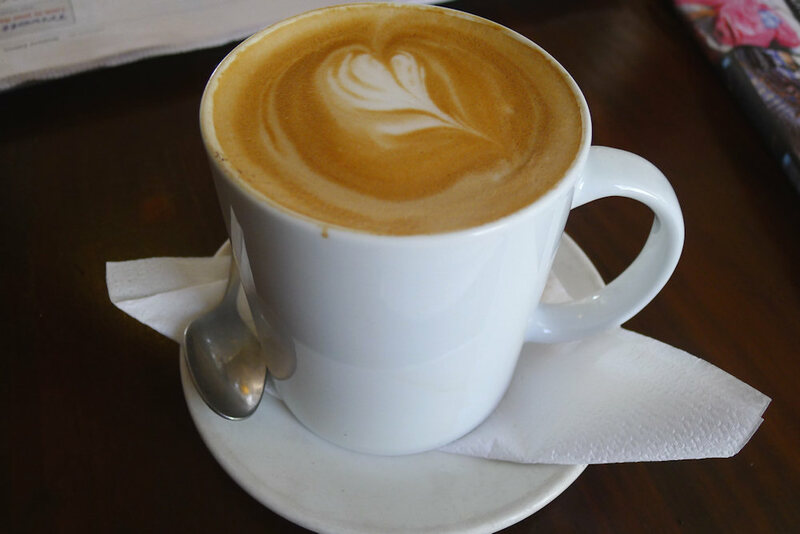 The large skim flat white ($3.50) was unremarkable when compared to some of the other cafés we’ve frequented in Sydney. 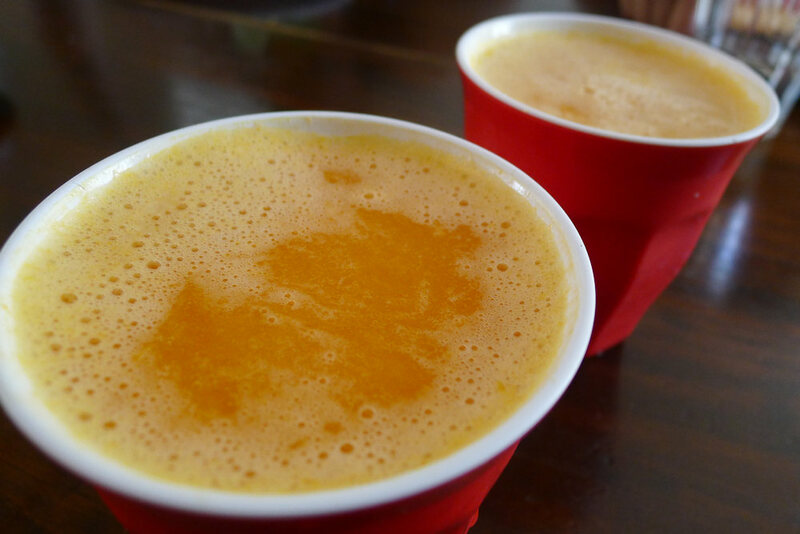 The freshly squeezed orange juice ($3.50) was just that. The oranges tasted great and made for a very refreshing drink. The red cups were super cute. A nice touch. 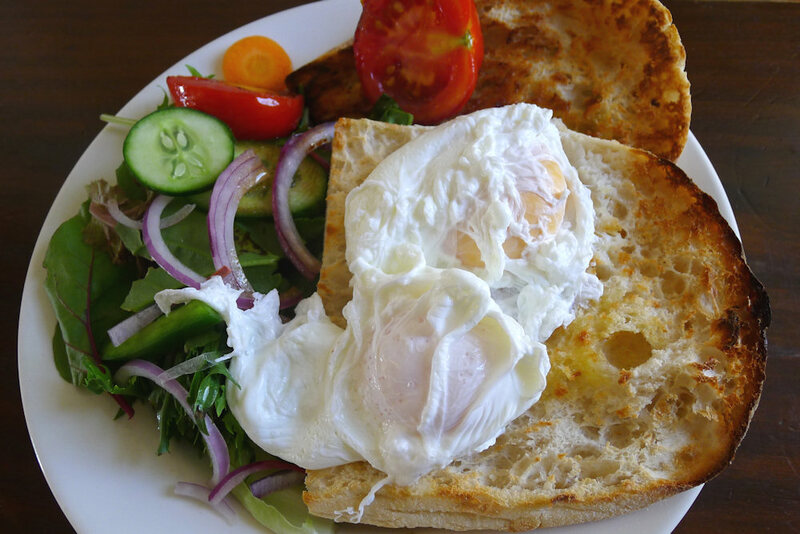 Our guest admitted to indulging in her chocolate milkshake and didn’t try much of her eggs, toast & salad ($7). The portions were very generous and it was great to have some salad on the side instead of plain tomatoes. It was hard to find the brekkie bagel ($12) under the plethora of mushrooms. 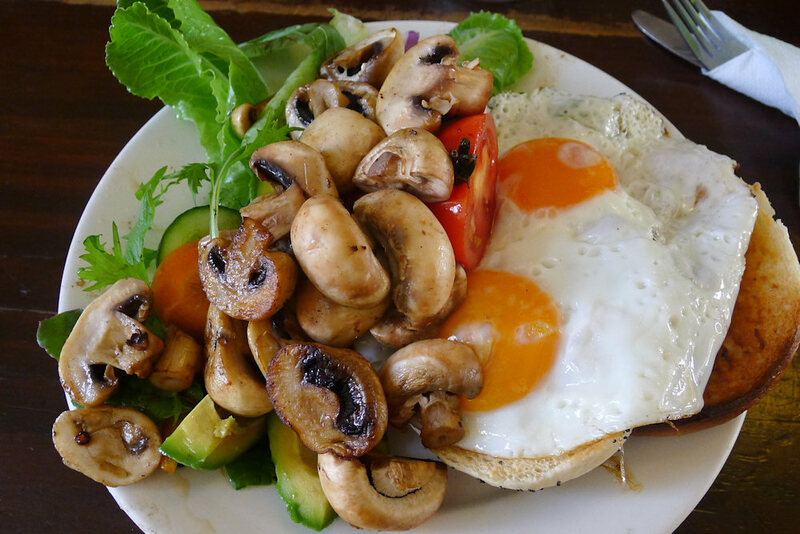 The freshly boiled bagel was delicious and the mushrooms were firm and moist. The waitress offered to replace the bacon for avocado which made the vegetarians very happy. For once we also had enough bread to mop up all that fried egg (April wasn’t game enough to try poached eggs again just yet). 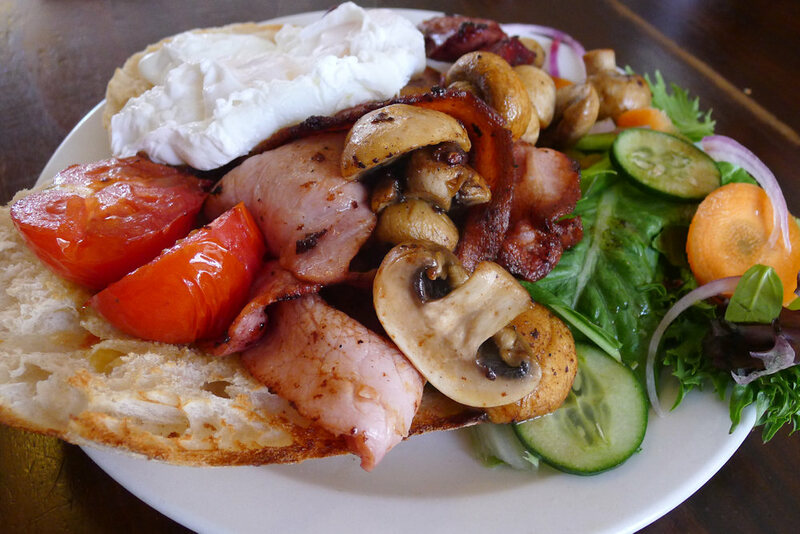 The big brekkie ($14) was well priced and included a stack of goodies including bacon, two eggs, salad, roasted tomatoes and Turkish bread. We’re lucky our guest had an appetite to match and was able to devour most of the meal. The fantastic colours, smells and full plates just kept on coming. 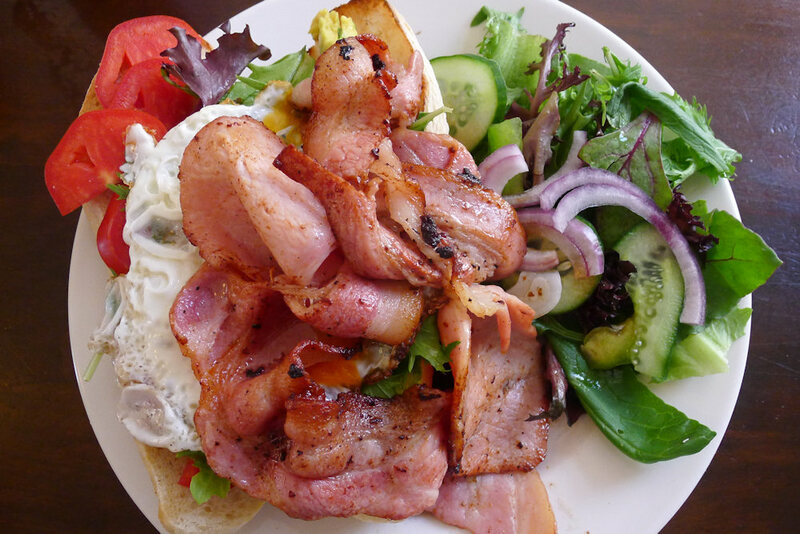 The BLAT (bacon, lettuce, avocado, tomato) on a casa roll ($8.50) was a sight to behold. It looks like you wouldn’t know where to start but thanks to some advice from one of our guests (a seasoned Ella visitor), Dane held the middle of the roll down with his knife, folded everything over and remarkably had a very easy to eat and delicious roll. The absolute freshness of the ingredients (crunchy lettuce, bright red juicy tomatoes, soft-with-some-crunch bacon and oozing egg) made for one of the most delicious breakfasts he had eaten in many weeks. This is definitely on our “order again” list. Two main things struck as as we ate at Café Ella: the size and quality of the food compared to the prices. We have not been to a café yet that can match the quality for price ratio represented here. Even though our food did take slightly longer than we would normally expect, comfortable clean surroundings, good conversation and friendly staff meant that we didn’t care! They also have a great lunch menu if you’re stopping by later in the day. 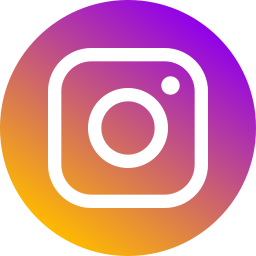 If you visit on a Saturday, be sure to visit the Eveleigh Farmers’ Market at the Carriageworks nearby which itself has numerous events and exhibitions throughout the year. This entry was posted in Sydney - South and tagged Dog friendly, Fresh fruit and vegetable stores close by, Outdoor seating, Parking close by, Reasonable prices. Bookmark the permalink. 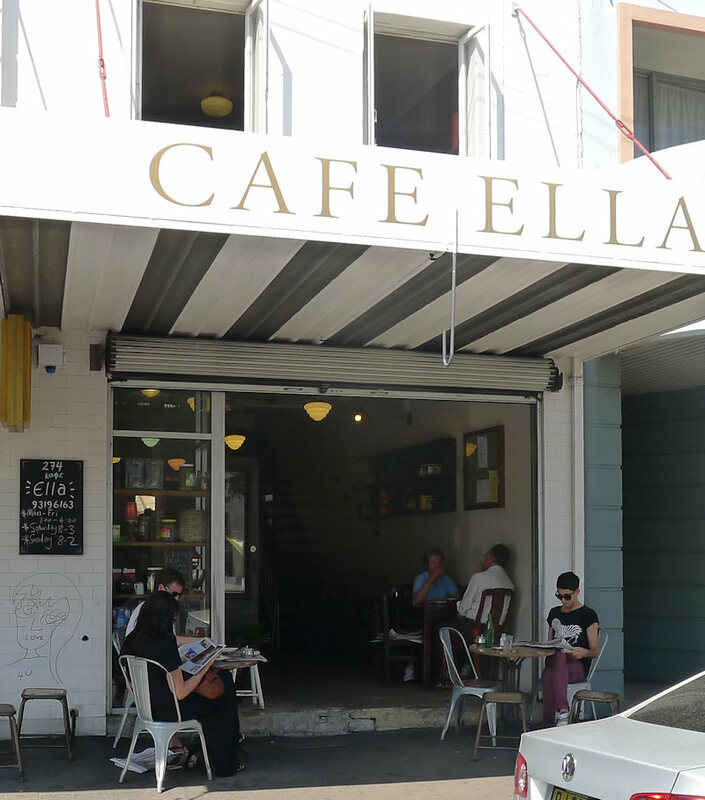 I’m glad Ella got the thumbs up – one of my all-time favourite cafes! I had the BLAT and added a poached egg, it was divine. The salad on the side really made the whole dish sing!